Socialist insurgent Bernie Sanders (I., Vt.) continues to dominate early Democratic primary polls among candidates who are actually running. His candidacy is a mortal threat to the party's dominant neoliberal establishment, which is why it is mobilizing to destroy him. The opening salvo comes courtesy of Think Progress, the activist arm of the Center for American Progress, a corporate-funded neoliberal think tank and Democratic Party powerbroker. The militant blog, which spent the entire 2016 election shilling for an unapologetic wealth maven (Hillary Clinton), has produced a video attacking Sanders for, of all things, the size of his bank account. The video paints Sanders as a hypocrite, accusing him of altering his signature attack line against "millionaires and billionaires" after the candidate reportedly became a millionaire thanks to the two best-selling books he's published since the 2016 election. The accompanying Think Progress blog post is rife with condescension. "It’s all very off-brand and embarrassing, but Sen. Bernie Sanders is a millionaire," reads the opening line. Bernie's class warfare shtick has become "quite the lucrative enterprise," which is "a bit awkward" for a candidate "who has spent the better part of his career saying ‘millionaires' like it's a slur." This is the bizarro world we're living in. Soon enough, the neolibs will be attacking Sanders for refusing to join the Koch-approved establishment consensus (more cheap labor, please!) on immigration. It makes a lot more sense when you consider the Democratic establishment's desire to keep corporate money flowing into its coffers. The non-profit Center for American Progress, for example, receives funding from Microsoft, Bank of America, Blackstone, Google, Facebook, the Chan Zuckerberg Initiative, AT&T, Fidelity, Schwab, Vanguard, CVS Health, and JP Morgan, among others. That was just in 2018. The previous year, CAP received funding from Walmart, the Walton Family Foundation, the United Arab Erimates, Apple, H&R Block, Pepsi, Samsung, Bluecross Blueshield, and General Electric, among others. 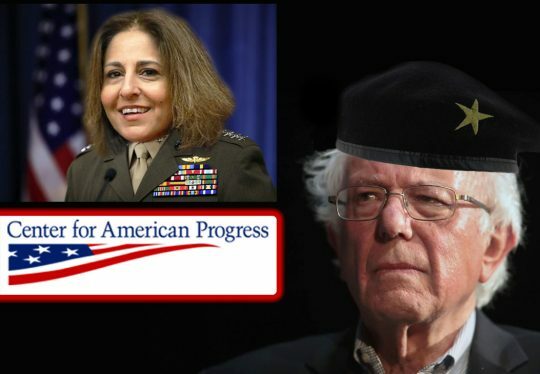 The twitter feed of CAP's president, Neera Tanden, offers a glimpse into how the organization views the Democratic primary. For example, she approvingly tweeted out this New York Times article detailing how Democratic voters are actually more moderate than the activists who dominate on social media. Tanden offered this cryptic take on Bernie's income. Whatever you think of Sanders’ millionaire income, it is quite a Rorschach of reporters’ and others’ priors. She has praised certain candidates. The following tweet is a good example of the disconnect between the Democratic establishment and the Bernie Sanders wing of the party. Whereas the establishment endorses "woke" capitalism — corporations are good as long as they embrace liberal identity politics — Bernie and his cohort see capitalism itself, however "woke" it may be, as the problem. It's gonna be a fun 18 months. This entry was posted in Politics and tagged 2020 Election, Bernie Sanders, Center for American Progress, Democratic Party, ThinkProgress. Bookmark the permalink.